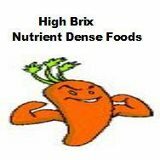 Jamil Avdiyev returns to The Appropriate Omnivore to talk more about his business High Brix Nutrient Dense Foods. High brix nutrient dense farming is a type of agriculture that goes way beyond organic. High Brix uses fertilizers that replenishes our soils and make the crops rich in nutrient and minerals. Jamil talks about his influences in learning about high brix agriculture. Jamil then gets into the foods he sells from almonds to blueberries to heirloom grains. He explains why he doesn’t see all wheat as bad and why heirloom wheat is the way to go. Jamil and also discuss other advantage of high brix nutrient dense foods, such as being able to keep bugs away and being good for your teeth.